Windows paint an over looked tool that has become more robust as of Windows 7 is a great but mostly unknown about tool for photos and social media. This tried-and-true program is now easier to use and more fun as well. You can touch up those phone pictures you want to post add text and much more. The new realistic digital “brushes” will bring your pictures to life in shades of watercolor, crayon, and calligraphy. Paint is now touch-ready too, so if you’ve got a touchscreen PC, you’ll soon be finger painting right on the screen. You can even use two fingers to trace two separate strokes. 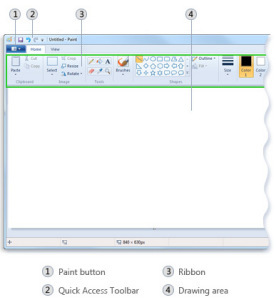 Paint was introduced with the first version of Windows, Windows 1.0. It was a licensed version of ZSoft Corporation’s PC Paintbrush, and supported only 1-bit monochrome graphics under a proprietary “MSP” format. 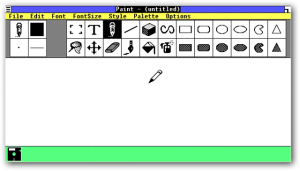 Paint was later superseded by Paintbrush in Windows 3.0, with a redesigned user interface, color support and support for the BMP and PCX file formats. The early versions were very crude and limited and if you really needed to edit photos or create banners or signs you needed very expensive graphics editing software. Windows 95 Microsoft introduced a new version of Paint. The same icons and color palette continued to be used through Windows XP. Not so useful a tool until Windows 7. ← 10% off all XPS PCs for a limited time!